This procedure covers the development of thermal profiles for BGA component removal and replacement using an the Air-Vac Smart Track BGA Rework System. The procedure will automatically develop an optimized profile. Figure 1: Place the tip of Thermocouple #2 on the center of the BGA component. Secure with Thermal Adhesive. Figure 2: Place Thermocouple #3, and #4 under opposite corners of the BGA Profile component. Place Thermocouple #5 under adjacent component. Secure Thermocouples the circuit board surface using High Temperature Tape. Figure 3: Place supports under circuit board to support area around BGA Component to be profiled. Figure 4: Position the IR Sensor Thermocouple #1 approx. 2" from edge of BGA component being profiled. This procedure automatically creates a thermal profile based on user-defined target parameters. These may include; board temperature, soak duration, BGA package temperature, BGA package ramp rate, solder joint temperature, and time over reflow. The Smart Track profile development method is non-destructive since drilling holes to embed Thermocouples is eliminated. However, profile development circuit boards may be subjected to multiple thermal cycles. The Smart Track method automatically adjustments heater temperature, gas flow rates, and duration on a real-time basis. The method uses an automatic repetition procedure, using information learned from previous runs to optimize the process. Read and understand all instructions that accompany each project prior to starting. Prior to starting the profile development process both the BGA Rework machine and the circuit board should be at, or near, room temperature. Avoid the use of fans to cool the circuit board or BGA rework machine during Profile Development. Doing so may interfere with the software program. Allow the circuit board and BGA rework machine to cool naturally. Profiles developed on one Air-Vac machine are portable, and may be transferred to other Air-Vac machines. Closest to the edge of the circuit board. In the most densely populated area. Near, or surrounded by, a ground plane. Select the BGA Rework Nozzle that will be used to develop the BGA Rework Profile. Nozzle Part Number should correspond to BGA physical size. Test fit Nozzle. Nozzle should fit over BGA component with minimal gap. Record Nozzle Part Number, BGA Component Height, and Circuit Board Thickness on BGA Rework Process Worksheet. Not package specific. Zero adjacent component clearance. Adjacent components within .300" may reflow. Component-specific design. 4-sided exhaust ports minimize adjacent component temperatures. Anti-crushing feature. Adjacent component clearance X=.100", M=.032". Component-specific design. Oversized heating tube optimizes thermal performance. Torlon corner standoff eliminates placement height concerns. Adjacent component clearance=.200". Also available with .100" clearance. Depending on the BGA Nozzle type, the epoxy that secures the Thermocouple to the top of the BGA component to be profiled may prevent the BGA Nozzle from contacting the circuit board surface. Test all Thermocouples prior to each use using a Digital Thermometer. The need to remove components or other hardware to allow the the location to fit under the nozzle without interference. If component need to be removed see appropriate procedure. Properly label removed components so that they can be replaced. Need to apply "heat shields" using high temperature tape or aluminum foil. Location of placement of Thermocouples. The corners selected should be those closest to adjacent components or ground plane areas. Place Thermocouple #5 under corner of adjacent component. Secure Thermocouple the circuit board surface using High Temperature Tape. Apply High Temperature Tape to divert hot air from BGA Rework Nozzle from flowing directly onto Thermocouple. Place one Thermocouple (#6) directly under the center of the BGA component on the opposite side of the circuit board directly in contact with the circuit board surface. Secure Thermocouple the circuit board surface using High Temperature Masking Tape. 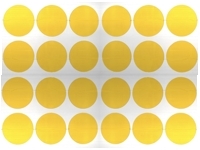 2 Top center of BGA component to be profiled. 3 Corner location under BGA component to be profiled. 4 Opposite corner location under BGA component to be profiled. 6 Bottom side of circuit board under center of BGA component to be profiled. Place the circuit board on the base of the BGA rework machine. Circuit board should be centered over the bottom heater. Clamp circuit board in place using built-in machine clamps. 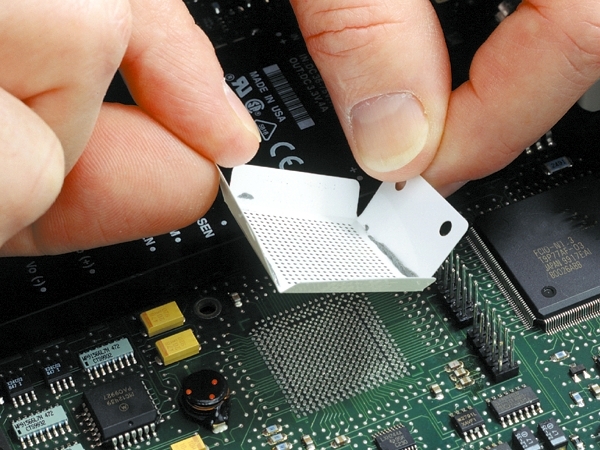 If needed, remove tape previously placed on the top of the BGA component to be profiled. Plug in the Thermocouples as shown in Table 1 - Thermocouple Locations. Install BGA Rework Nozzle in BGA Rework Machine. Depending on the nozzle type, the epoxy securing the Thermocouple to the top of the BGA component may prevent the nozzle from contacting the circuit board surface. Position circuit board so that BGA component to be profiled is aligned below nozzle. Fine adjust X, Y and theta positions and lock the machine base. Power on the machine. Pass "operator registration" and "password log in" screens. Select "Control" - "Thermal Smart Track" - "Auto Temperature Profiling". The Thermal Smart Track screen appears. The system will automatically initialize the process parameters (user-adjustable) to the default (standard) settings. These factory settings represent a good starting point to begin the profile. If needed, the system will make adjustments automatically during the "optimize" cycles. Enter the following information onto the screen. Values may vary depending on the application. T/C - Highlight Thermocouples being used. Nozzle Control Flow (%) Set by selecting Nozzle Part No. Recheck the values are entered into the "Automatic Temperature Profiling" screen. In the Options section, Click the "Cycle Start/Stop" icon to start the Automatic Temperature Profiling cycle. If Automatic Temperature Profiling cycle fails to start, follow the "Pop-Up" instructions. Monitor the process and stop the system if the Board Control T/C #1 temperature exceeds 183 C.
Board - This stage ends when the Board Control Target temperature is reached. Preheat - This stage ends when the PCB Target temp. of the Board Control is reached. Soak - This stage ends when the Soak Seconds value of the Device Joints is reached. Reflow - This stage ends when the Reflow Seconds value of the Device Joints is reached. Cool Down - This stage ends when the solder joints are under 183 C.
If all of the Thermal Profile Parameters have been met on the first pass "Done" indicator will be illuminated. Proceed to section 5.0 Profile Saving. If all of the thermal profile parameters have not been met on the first pass the "Optimize" indicator will be illuminated. The system will automatically run up to 3 additional cycles. Do not Start or Stop the machine, nor make any parameter changes. System will restart another cycle once the circuit board has cooled down to the Board Control T/C #1 Start Temperature. The following Process Optimization Rules may be applied during the Optimize cycles. Only one rule can be applied per optimize cycle. 001 - The targeted device joint average temperature was not achieved. Attempt to increase device top maximum temperature by 5 C. If the device top maximum temperature is currently implemented, the rule is skipped. 002 - The actual reflow time was less than the target reflow time minus 10 seconds (the system provides a 10 second success window). To compensate, the system will consider the actual cool down time. Next, the system will compute the necessary time extension to achieve the targeted reflow seconds. This time extension is implemented using a device joint average temperature maintain mode. The heating and flow sub-systems will be pulsed on/off to maintain the current device joint average temperature rather than simply turned off when the joint temperature is reached as in the original cycle. 003 - The target device joint average temperature was not achieved. If the targeted device joint average temperature is at the minimum, the rule is skipped. If the system changes any values, record the values on the BGA Rework Process Worksheet. After the additional Profile Cycles, the system will illuminate the "Done" light. If an optimized cycle can not be achieved, the system will report this condition to the user. Refer to Air-Vac manual for further information. Save the new Profile by clicking on the "Save" button in the upper left corner of the screen. Click on the "Thumbs Up" icon, the OK, then Click on the "Thumbs Up" icon again. Using "Print Options" print a copy of the graph page, and run a Data Point Summary Report. Click on the "Thumbs Up" icon to display a new screen. Check the "Build Profile" box. Check the "Component Removal" box. Check the "Removal Retry" box. Check the "Component Placement" box. Record the Nozzle Length: Click on the "Asterisk" (*) and select the nozzle size. Record the Device Height: Click on the "Asterisk" (*) and select the BGA type. Record the circuit board thickness: Enter the value. Send the file to: Profile Library 1/99. Click on the "Thumbs Up" icon. Click on Save = OK. If needed, the new Profile can be tested. It is suggested that the Removal cycle be performed using this new profile. When complete, remove all Thermocouples except the #6 Bottom Side. 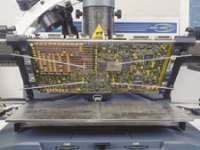 Remove the circuit board from the machine, and store for further use.